mass of people move silently through woodland. It isn’t clear where they have come from or where they are going :only that they are on a journey. High above a quarry, the crowd wait and watch as a solitary woman sinks into a pool of water. Is she the legendary Simorgh – part-bird, part-goddess – from whose eggs the world was made? Is it she who they are searching for? A synthesis of live performance and multiple projection, inter cutting seamlessly from stage to screen, Logic of the Birds is inspired by Persian poet and mystic Farid al-Din ‘Attar’s 12th century masterpiece The Conference of the Birds, an epic affirmation that true enlightenment can only come from within. It tells the story of a flock of birds on a quest for meaning: a journey of hardship undertaken across seven dangerous valleys in search of their leader, the Simorgh. This ancient Persian text serves as a new point of departure for a group of contemporary Iranian artists all now living in New York. 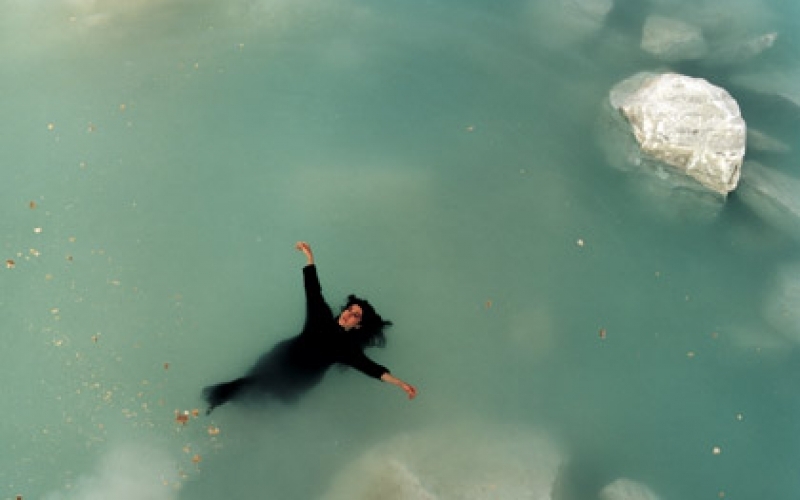 The group have collaborated on several occasions with Shirin Neshat in the creation of the cinematic installations that have given her work such a dedicated international following, but here they have come together in a different way allowing their diverse skills to meet afresh as equals. Within a specially-created environment, which transforms the gothic interior of Islington’s Union Chapel, Sussan Deyhim leads the silent chorus – moving deftly between media – in a delicate alchemy of image, action, sound and space. The hour-long performance was the central part of the 2002 Intimations of Immortality festival in London, previously performed that year in New York and Minneapolis. This experimental multi-disciplinary theatrical production based on Attar’s Language of the Birds, directed by Shirin Neshat, Shojaz Azari, Ghasem Ebrahimian and featuring the performer Sussan Deyhim, Logic of the Birds was commissioned by Artangel along with Change Performing Arts, The Kitchen, Walker Art Center, and RLG Productions in the United States. The performance was made possible with support from the Rockefeller Foundation Multi-Arts Production Fund, and with public funds from the New York State Council for the Arts. Additional support was provided by the National Endowment for the Arts for a partnership between The Kitchen and MASS MoCA, as well as The Peter Norton Family Foundation, The Roy and Niuta Titus Foundation, The Soudavar Memorial Foundation and individual contributors. Logic of the Birds is also a sponsored project of the New York Foundation for the Arts. Logic of the Birds is a non-literal re-adaptation of the mystical text by the Persian philosopher and poet, Attar. The narrative, which is a combination of film, music and performance, traces a mass of people, without clear identities (birds) who follow a mythical leader through a difficult, transformative journey, only to discover in the end that they contain within themselves the qualities they searched for in the leader. In this work we have attempted to extract what we consider the essence of the philosophical text and its message of self-revelation, presented in an exercise of visual, lyrical, musical, and performative symbiosis. 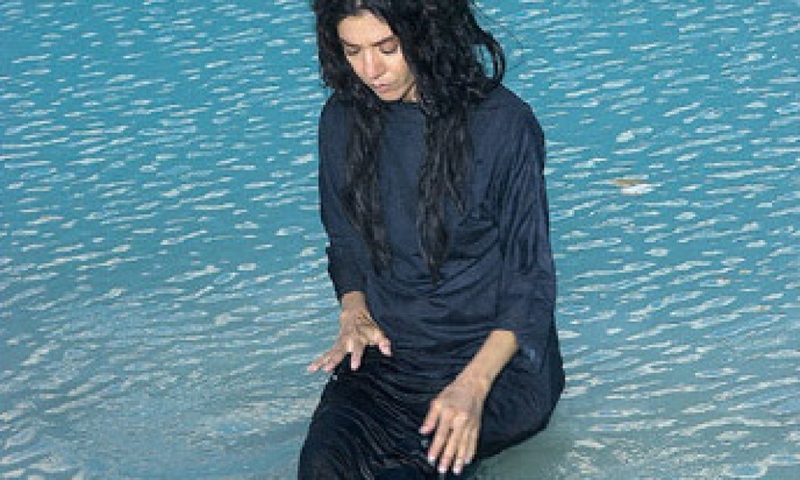 This production explores the dynamic / attraction between the mass and a female protagonist (Sussan Deyhim as the equivalent of Attar’s hoopa bird) whose nature is uniquely both human and divine as well as compassionate and devilish, focusing on the development and transformation of this relationship. Conceptually and visually, Logic of the Birds explores the concepts of illusion and reality and individual and collective which are fundamental aspects of Persian and Islamic mysticism.